Sariwati, Dwi (2005) Hubungan antara persepsi terhadap dukungan suami dengan tingkat depresi pada penderita kanker leher rahim. Skripsi thesis, Universitas Tarumanagara. Cervix cancer is the most decease suffered by Indonesian women. lf someone positively infected by this decease she can be depression. Support by her closed people and be loved specially her husband hopefully can reduce her depression. 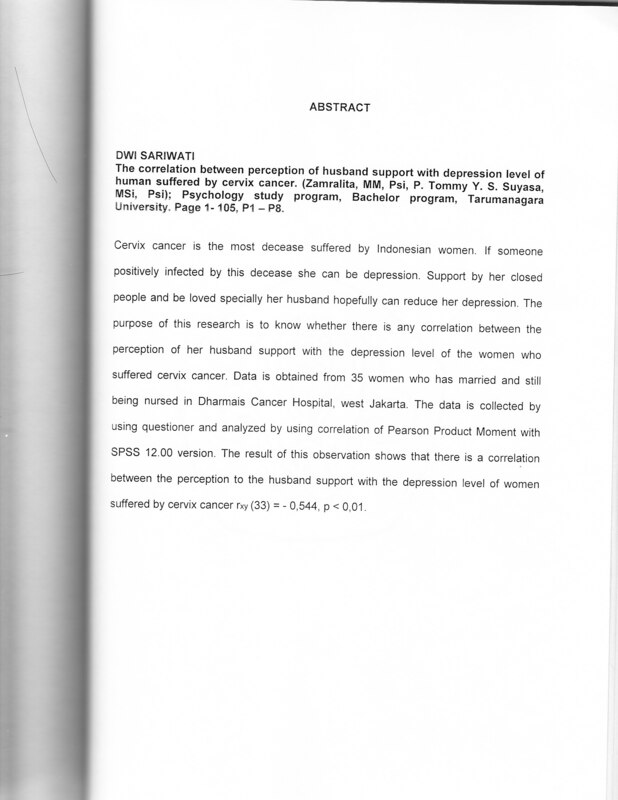 The purpose of this research is to know whether there is any correlation between the perception of her husband support with the depression level of the women who suffered cervix cancer. Data is obtained from 35 women who has married and still being nursed in Dharmais Cancer Hospital, west Jakarta. The data is collected by using questioner and analyzed by using correlation of Pearson Product Moment with SPSS 12.00 version. The result of this Observation shows that there is a correlation between the perception to the husband support with the depression level of women suffered by cervix cancer rxy (33) = - 0,544, p < 0,01.